The rate of insecurity in Ojo Local Government Area of Lagos State has reached an alarming stage. It has reached a point where kidnappers now lay siege to the creeks and around school premises to abduct pupils and other residents. The council, bordered by creeks and nicknamed by politicians as ‘Ojo Majority,’ has continued to record persistent kidnap cases which have thrown the communities into confusion. The kidnapped cases started with school pupils, compelling the Director-General of the Office of Education Quality Assurance, OEQA in the state, Mrs. Ronke Soyombo, to urge parents to take their children to and from schools daily to avoid being abused sexually or kidnapped. The case started with the kidnap of three, four-year-old children in Ago-Tapa community, Okokomaiko, Ojo Local Government. The three—two males and one female—were identified as Chibuzor Nwosu, Bayo Adeyemi and Barakat Saka. Chibuzor Nwosu, male, was kidnapped on June 24; Miss Barakat Saka, female, four-year-old went missing June 28, and Bayo Adeyemi, male, was abducted on June 28. Bayo, a pupil of Fazil Omar Ahmadiyya, Primary School, Okokomaiko, was said to have been kidnapped on his way home after closing hours. The kidnappers’ inability to gain access to the school premises made them wait outside until the pupils were leaving for their respective homes. The residents lamented that the locations of the kidnappers have not been known nor was the pupil released. In an chat with Vanguard, the chairman of the School Management Committee, Mr. Sheriff Adebayo, narrated that the child and his elder brother were on their way home when the abductors, who were in a bus, accosted them on the road and gave the elder brother a N100 note, to buy candy and biscuits. The victim’s elder brother demanded to go on the errand with the victim, but they (kidnappers) ordered him to leave his brother behind. On his return, he added that the child discovered the bus was leaving the scene “and because he is a child, rather than raise alarm, he ran home to alert the mother and before they arrived the kidnappers had disappeared.” After this over three cases of child abduction in schools were foiled by the residents in the council. Aside this, the Former Commissioner for Rural Development, Mr. Cornelius Ojelabi, revealed at the Townhall meeting organized by the state government in Badagry, that his grandson and about five others were kidnapped by unknown gunmen, lamenting “their whereabouts have not been known.” Last Sunday, Ojelabi further disclosed that two persons were also kidnapped in the council within one week in July, 2016. His words, “The government needs to really focus on how the spate of kidnappings can be nipped in the bud in Lagos State. The issue of kidnapping is becoming alarming. Between Monday and Saturday, we recorded two others. The two persons kidnapped were above 30-years-old. “This is within a week. It is sad. We are ready to partner with the government to tackle this. Even as I sympathize with the community for the ugly incident but we all must realize that the issue of security is a collective responsibility. Wherever there is insecurity, the commercial activities in that corridor will be halted. There is need for us to police the creeks. That is where they have the wherewihal to attack the communities,” he added. As the act continued unchecked, it snowballed into the kidnap of prominent persons within the council, forcing many to raise concerns over the state of the creek that borders the council on the North. First among them was the kidnap of the Oniba of Iba Town, Oba Yushau Oseni on Saturday night from his palace when he was about taking his bath. While whisking away the monarch, who was in shorts, away from his palace, the over 15 gunmen who had stormed the community two hours before the abduction, shot five persons including the Oba’s wife. 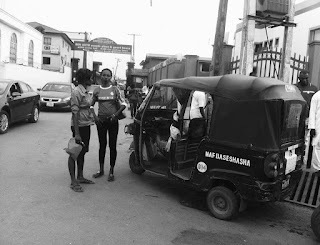 Three of the victims have died including a 25-year-old artisan, Riliwan Rasak, the palace guard, Sunday Okanlawon and a-yet-to-be-identified commercial motorcycle operator. Mrs. Nofisat Oseni, wife of the Monarch narrated the incident which could be seen in her gloomy eyes saying “four of the gunmen took my husband through the backdoor, the other two left through the main gate of the palace. He was whisked away through the Iye-Egbe creek. She added that, the number of casualties they were aware of was one-the security man. “There is no report of the Okada man that was shot dead,” he said.